The long-awaited return of Westerham Brewery to the town has taken its first major step with the opening of a tap room and shop. It is more than 50 years since the industry left Westerham and the new £1million-plus venture has now been unveiled at Charmans Farm. 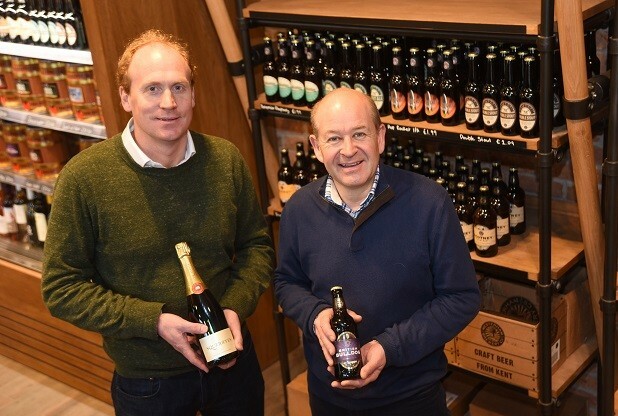 The Westerham Valley project is the brainchild of brewery owner Robert Wicks and Henry Warde from the Squerryes estate, who owns the land being used in Beggars Lane. It is around eight years since the pair first discussed the scheme and they hope the brewery as well as the Squerryes winery will be completed by next spring. And Mr Warde hopes the development will add to the town’s status as a haven for tourists from Kent and further afield. He said: “Squerryes is very proud to have built the brewery and winery building and to be part of bring the Westerham Brewery back to Westerham and to be a tenant on the estate. “Our £1.3m investment should be a great boost to the local economy. The tap room and shop is selling a range of Westerham Brewery produce including draught craft beer to take home, gift boxes of bottled beer and a variety of Christmas beer gifts. It is open Tuesday to Saturday between 10am and 6pm and Mr Wicks says the move represents a new chapter in the town’s history, nearly 52 years after the Black Eagle Brewery ceased brewing. “The tap room and shop will be the focus of our plans to bring beer lovers to the new brewery,” he said. “In early 2017 we will begin the process of transferring our plant from Crockham Hill to Westerham. “We hope to complete this by March in time for the 52-year anniversary of the last brew of Special Bitter Ale which took place in Westerham on March 3, 1965. “The tap room and shop will allow customers to experience the ingredients, taste the beers and in time enjoy tasting the beers in The Gallery looking out into the main brewery. The building has been made using oak from Westerham Wood with the pair saying localism is “very important to us” and Mr Wicks says the scheme has used local suppliers as much as possible so they “feel part of what they have produced”. “This localism extends to our ingredients,” he added. “We have invested large sums in boring 90m into the Hythe beds to supply the greensand aquifer water that has made Westerham an important brewing centre for over 400 years. But it is not just the hops that have received accolades as earlier this year Squerryes’ 2011 Brut won the UK National Championship at the Champagne and Sparkling Wine World Championships.